How many of us grew up hearing our parents say; "If you can't say something nice, do not say anything at all"? This is excellent advice, and sadly, something people seem to have forgotten in this age of twitter and facebook posts which can be so unkind. But, it is still excellent advice and something we should not only observe in our own lives, but be intentional about teaching our grandchildren as well. As we think about showing love, one big way we do this is with the words we do say. Look at Colossians 4:6 - "Your speech should always be gracious and sprinkled with insight so that you may know how to respond to every person." (CEB) This verse tells us the words we say should ALWAYS be gracious and insightful. 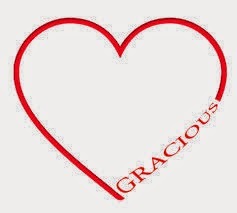 The dictionary defines, "grace" as; "A controlled, polite and pleasant way of behaving" and "gracious" as; "marked by kindness, courtesy, tact and charm". So, how can we show this with the words we say and how can we teach our grandchildren to speak with grace? Consider the following . . . When our grandchildren are misbehaving, or not settling down we may be tempted to be at the least, abrupt with them when they are not listening and possibly even harsh at times, but God tells us our speech should ALWAYS be gracious and insightful. This is important at all times, but especially when our grandchildren are not listening. If we are able to remain calm, loving and gracious it will not only be more effective, but will show God's love to our grandchildren. When they misbehave, speak calmly, quietly and with grace! When our grandchildren speak unkindly to a sibling. This is an opportunity to help them learn God wants their speech to ALWAYS be gracious and insightful. If they are able to remain calm, loving and gracious, especially when their sibling - or friends - upset them, they will be able to show God's love to others! Being a person who shows love by ALWAYS speaking with grace and insight is something we can not just "tell" our grandchildren to do. It must be something they see us do. If they are able to see us model being gracious and insightful at all times, they will understand how to be people who are sure their speech is ALWAYS gracious and insightful; and when it is, they will be showing love, too!